BULK VENDING MACHINES FOR SALE!! These bulk vending machine suppliers are listed alphabetically by company name. These bulk vending machines can vend: candy, nuts, mints, gumballs. Please contact these bulk vending machine suppliers direct for more information about their machines. Also see: Vending Machines, Gumball Machines, Interactive, Bulk Candy Products, Bulk Candy Machines for sale, Business Opportunities, Nuts, Candy, Gumballs, Stands, Product Distributors, Stickers, Locators, Honor Snack Boxes, POST YOUR COMPANY-Get New Business! TREASURE CHEST GIVEAWAY “CHARITY VENDING” Master Distributorship Opportunity – Timing is Everything and the Right Time is NOW as we launch our New Exciting High Cash Producing Business Opportunity across North America. High Prize Value and Charity tie-in makes this a HUGE WINNER! Contact Dave 720-255-1847 for details. Visit Website. On The Ball Vending – New & Used Bulk Vending Equipment for sale!! 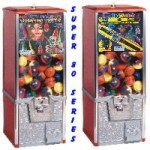 New and used bulk vending machines — Northwestern and Oak models available — FREE shipping!